The Late Oligocene pre-Eonile paleoriver flows northwesterly over the Eocene Limestone Plateau in the east central Western Desert, west of the Nile Valley (Sohag), building an alluvial plain and leading to the karstification of the limestone bedrock, as paleoerosional surfaces and paleodolines. Knowledge of this alluvial karstification is completed with the detailed studies of the sedimentary evolution of the fluvial system and its contemporary deposition. 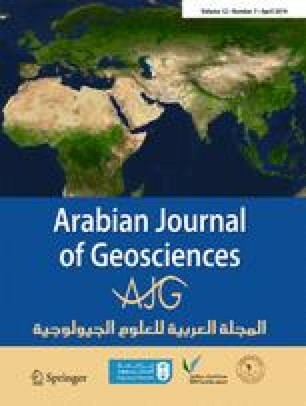 Analysis of the sedimentological and geomorphological features allows discussing the natural environmental conditions that favored karst in the past and its main genetic mechanisms. The architectural elements of the fluvial deposits indicate that they were deposited in a gravel-dominated braided fluvial system, characterized by high availability of water and sediment supplies. The current study proves that genesis of paleodolines was mainly related to this high water supply. Some of them were progressively filled by syn-sedimentary deformed unconsolidated deposits. Such deformation is due to dissolution of the underlying sagging synclinal limestone, conditioning the location of sinking waters where preferential dissolution and later suffosion took place. A model for the evolution of the paleodoline fills is proposed and interpreted in three different stages: (1) gravitational processes developed and disorganized gravels were remobilized and dragged toward the created paleodolines; (2) flooding of the paleodolines acted as lakes where Gilbert-type deltas and gravel slope deposits accumulated, exhibiting several unconformities interpreted as a result of continued subsidence of the paleodoline related to dissolution; and (3) nondeformed fluvial facies sealed the whole deposits, marking the end of the karstification process. Combinations of different types of factors that could cause karstic subsidence and associated hazards include soluble rock lithology, paleoclimate, and deformational structure. The authors are deeply grateful to Prof. Dr. A.M. Al-Amri (the editor-in-chief) and the anonymous associate editor and reviewers for insightful comments and criticism that improved the original manuscript.